Bologna’s beating heart is its university, which boasts a diverse and illustrious alumni including Dante, Copernicus and more recently the filmmaker Pier Paolo Pasolini and novelist Umberto Eco. Founded in 1088, it is the oldest continuously operating university in the world and has a student body comprising 100,000. The presence of such a large number of young people makes Bologna a buzzing, happening place to spend one’s time. The city’s more practical face is the Bologna Exhibition Centre, a massive complex located just north of the centro storico. La Fiera, as it is known, hosts trade fairs representing an enormous range of industries, but its best-known offerings are the Bologna Motor Show, the Bologna Children’s Book Fair and CosmoProf, the international beauty industry’s most important event. So there’s plenty going on in Bologna in the worlds of work and study, but what about those moments when work is done and it’s time to relax? The best way to experience the city is on foot and the natural place to start is at its very centre, Piazza Maggiore. 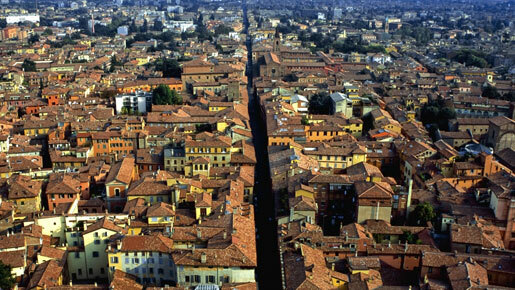 Bologna is organised according to a street plan designed by the Romans and extended in the 12th and 14th centuries. The result is a beautifully symmetrical and manageably sized historic centre whose perimeter is marked by the 12 gateways – only seven of which are still standing – that used to be the only routes into the town. Piazza Maggiore is dominated by the magnificent but unfinished Basilica di San Petronio (0039 051 225442; open 07.45-12.30 and 15.30-18.00 daily in summer). At its conception in 1390 San Petronio was intended to dwarf St. Peter’s in Rome, but it was scaled down during construction after a jealousy-inspired mandate by Pope Pius IX. It remains, however, the fifth largest church in the world and an extremely impressive sight by anyone’s standards. Once inside the cavernous space, look for the 15th century fresco that has made Bologna a target for extremists due to its depiction of a scene from Dante’s Inferno in which Mohammad is tortured in hell. Also worth spotting is the 66.8m meridian line – the longest sundial in the world – designed by Giovanni Domenico Cassini, the 17th century astronomer who first discovered Saturn’s moons. Piazza Maggiore is a fantastic place to sit and watch the world go by, especially at passeggiata time, the moment in the day just before dinner when Italians take to the streets to stroll about, meet with friends and catch up on the day’s news. There are plenty of cafès to choose from but the chicest spot on the piazza is undoubtedly Rosa Rose Cafè (Piazza Maggiore, 2; 0039 051224782). Drop in for a cocktail at aperitivo hour to mingle with Bologna’s smart set and sample treats from the snack buffet. From June 26 to July 3, Piazza Maggiore plays host to a 5,000-seat open-air cinema as part of the Bologna film festival, Il Cinema Ritrovato (Cinema Rediscovered), screening films old and new for free on sultry summer evenings. Festival screenings take place at other locations across the city too, so check www.cinetecadibologna.it for listings. Nearby Piazza Santo Stefano is the most desirable of the historic centre’s residential neighbourhoods. At one end of the cobbled triangular piazza stands the Basilica Santo Stefano, a compound of religious buildings originally made up of seven churches, only four of which now remain. The 11th-century Chiesa del Crocifisso holds the bones of Bologna’s patron saint, St. Petronius. Attached to this church are the Chiesa del Santo Sepolcro, the Chiesa della Trinitá and the Chiesa Santi Vitale e Agricola. The latter features some Roman flooring and carvings, brought to the church when it was built in the 11th century (0039 051 22 32 56; open 09.30-12.00 and 15.30-18.30 daily). On the second Sunday of the month (excluding July and August), Piazza Santo Stefano hosts a charming antiques market, which runs from 08.30 to 19.00. Bologna is a city obsessed with good food. For the ultimate sweet treat, visit La Sorbetteria Castiglione (Via Castiglione, 44; 0039 051 23 32 57), which serves rich ice cream and refreshing sorbets, all made fresh on the premises. If it’s a glass of wine and sharing plates of cheeses and cured meats you fancy, there’s no better place than the tiny and highly atmospheric Osteria L’Infedele (Via Gerusalemme, 5; 0039 051 239 456), the short walk to which will take you past the home of former Italian Prime Minister Romano Prodi (at number 7), guarded around the clock by a pair of bored-looking carabinieri. For something more substantial however, a very special dining experience is just down the road. Drogheria della Rosa (Via Cartoleria, 10; 0039 051 22 25 29) serves hand-made stuffed pasta and traditional cuts of meat in an intimate and charming atmosphere. Try the tortelli with stracchino and squaquerone cheeses and courgette flowers followed by fillet steak with aged balsamic. If all the stunning architecture and delicious food hasn’t exhausted you, Bologna’s Teatro Comunale, located in the heart of the university district, is one of Italy’s foremost opera houses. Finished in 1763, but refurbished twice during the nineteenth century, it is an opulent affair perfectly suiting the high dramas that take place there during the season. Puccini’s 1889 opera, Edgar, will be performed daily from 18 to 25 June (times vary, check www.tcbo.it for details). Understated Bologna may be, but if you’ve got a day, an evening or just a couple of hours to fill, there’s no better place to find yourself.